Jeff Danson aka Heavvy is a Canadian born stand up comedian and producer based in Los Angeles with a strong passion for eating. Heavvy first started writing for twitter accounts like Iron Sheik when rated top 25 funniest account on FHM & Sports Illustrated in 2009. 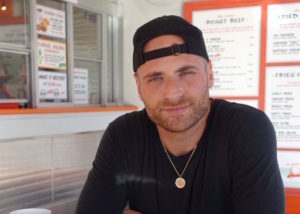 He started stand up in New York City the same year, and transitioned to LA in 2014 when he sold his first show, “Hungry Hungry Heavvy” to MTV. When he’s not running his sold out monthly stand up show, “Heavvy Sets” at the Hollywood Improv he’s bouncing between New York, Toronto, and LA working on his new Podcast, “Flourish Heavvy.” Heavvy has made appearances on MTV, Comedy Central, GQ, Funny or Die and TNT. Keep an eye out for one of his food travel shows, and first comedy special being released in 2019!